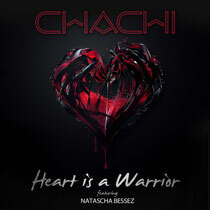 With vocals from Natascha Bessez, ‘Heart Is A Warrior’ by Chachi is the latest release by the New York DJ - who has exclusively announced his partnership with Tommy Boy - and tells the tale of a girl getting over the heartbreak of lost love and finding the power to move on with a strong heart. Entering 2014 on the same note as he closed 2013, Chachi begins a busy year both on the road touring and spending time in the studio. On New Year’s Day he released his Split Personalities podcast and gained a legion of new fans who saw it as a good start to the year. With the release on Tommy Boy, the stage has been set for one of New York's most famous and iconic labels to team up with one of the city's most promising and exciting young artists. The track also has remixes from Sted-E & Hybrid Heights, Toy Armada & DJ Grind, Jay Dabhi, Danny Olson and Rick Wonder. As of late, Chachi has been traveling the world, performing at SL in Miami, Hard Rock in San Diego, London Box in Santo Domingo, Xtine in Puerto Vallarta, Vertigo in Kuala Lumpur, Mink in Singapore, Spark Beijing in China and Spark 101 in Taipei. He holds residencies at HQ in Atlantic City as well as Finale and No.8 in NYC. It’s out today on Beatport, check it out below.